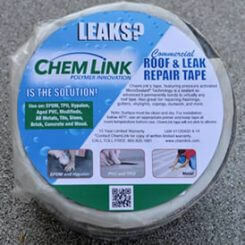 ChemLink ChemCurb was developed to address the most common source of leaks – Roof penetrations. Pipes, mechanical equipment, vents, solar panels and lightning protection are examples of penetrations which, in time, will create avenues for water. Repeated cycles of load, heat, cold, moisture, water ponding, and ultraviolet inevitably degrade pitch pans, rain caps, boots and other types of seals aimed at preventing leaks. The ChemLink ChemCurb System replaces the old style metal pitch pans with versatile precast curb components, pourable sealant, and structural adhesive/sealant. 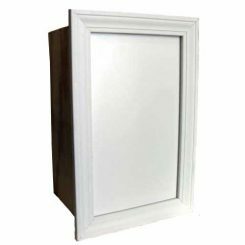 The system can usually be installed in under 15 minutes and eliminates the need for flashing or mechanical attachment. Rapid installation – reduces labor significantly. 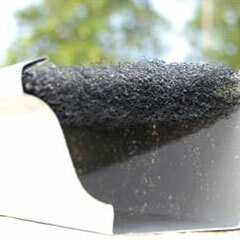 Excellent adhesion to most roofing materials. No flashing or mechanical attachment required. 1-Part® pourable sealant accommodates movement and is suggested for use on all granulated membranes and details with excessive movement. 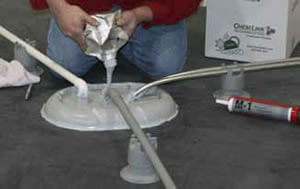 Sealant is flexible down to -40°F (-40°C). ChemCurb exterior rings, straights, and corners. M-1 Structural Adhesive/Sealant used for bonding the ChemCurb components, sealing and priming the penetration. 1-Part Pourable Penetration Sealant or PRO PACK™ two-part urethane pourable sealer. Both sealants are used to form a durable, water-tight seal around the roof penetration.